We just got our FiOS internet hooked up. I opted for the 20Mbs up, 5Mbs down option. 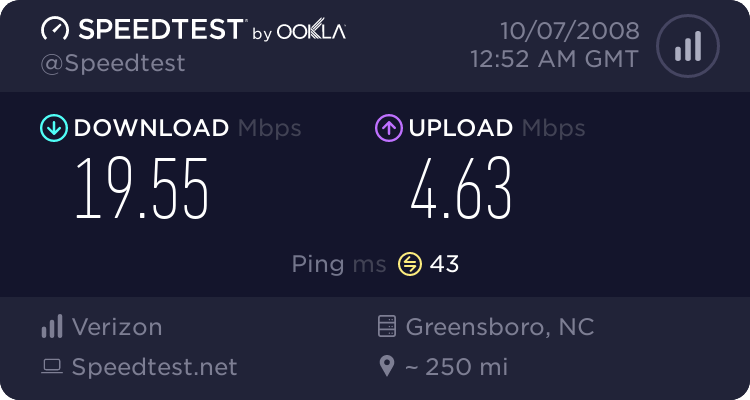 Here's a bandwith test from speedtest.net: Other than being really annoyed at how difficult (i.e. almost impossible) Verizon makes it to use your own router instead of theirs, it's pretty awesome. I'm in the process of wget-ting the internet as we speak. Starting with .com. I saw the greatest log message in my MacBook's system log this morning. I'm sure it's something normal, and, given appropriate context, would make perfect sense. But I am just amused that the SyncServer is vacuuming up all the truth. No wonder I have a hard time finding useful log messages when I'm trying to troubleshoot something.